Great Northern Builders (GNB) specializes in fire and smoke damage restoration and water damage repairs throughout Minnesota and Wisconsin. If you have damage from fire, call Great Northern Builders! It’s important to call an expert for an assessment. We provide immediate assessments and expert fire restoration services and take care of your fire damage restoration, water damage restoration, smoke cleanup, odor removal projects. Our trained team is your single-source solution to handle every aspect of a fire loss. Recovery from smoke and fire damage is sometimes impossible without professional help. 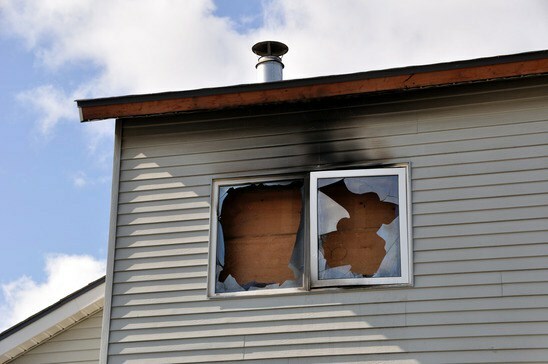 Smoke damage becomes harder to remove over time and doesn’t go away on its own. It is important to realize that smoke and fire problems do not stop with char damage. The longer you let the smoke and odors linger, the more they soak into your carpets, furniture, appliances, paint, upholstery, drapes, walls, family belongings and/or office equipment. Temporary fixes like household deodorizing sprays may work in the short-term, but wear off quickly and can interact with smoke odor and create additional odors. Great Northern Builders quickly assesses the damage to mitigate the problem and remove odors and hazardous particles quickly. When disaster strikes, call Great Northern Builders. Great Northern Builders professionals perform a thorough damage assessment of your property, taking the time to look for damage that may not be readily apparent to the untrained eye, such as structural damage. If necessary, we’ll provide emergency temporary board-ups, tarps and other protection to prevent further damage from rain, ice, snow or wind, and unwanted intruders. Great Northern Builders will then start the fire, smoke, water clean-up, restoration and repair process. Call the Fire Restoration Repair Experts at Great Northern Builders today at 651.455.9371 or Contact Us below for a Free Property Inspection!